If I understand them correctly, Brady et al. (2014) provide evidence from DNA studies that the genera listed in the key (below), together with the Madagascar genus Tanipone (see Antweb) fall within Dorylinae but are separable from true "army ants". Within Cerapachys they found a group with marked lateral margination on the petiole was distinct enough to perhaps warrant elevation to genus status under the name Lioponera. As yet, however, that seems to remain invalid as a formal published genus. For the Old World Sphinctomyrmex which were separable from the New World forms, including the genus type species S. stali, they "informally" used the next oldest available name Eusphinctus (type species furcatus an Asian species). Similarly, that remains informal (as at November 2015). Borowiec (2016) has proposed a further step along the above lines. This appears to be endorsed by the California group of workers, perhaps headed by Brian Fisher, who also happens to be the relevant Zookeys editor. Lioponera Mayr, 1879, gen. rev. = Neophyracaces Clark, 1941, syn. 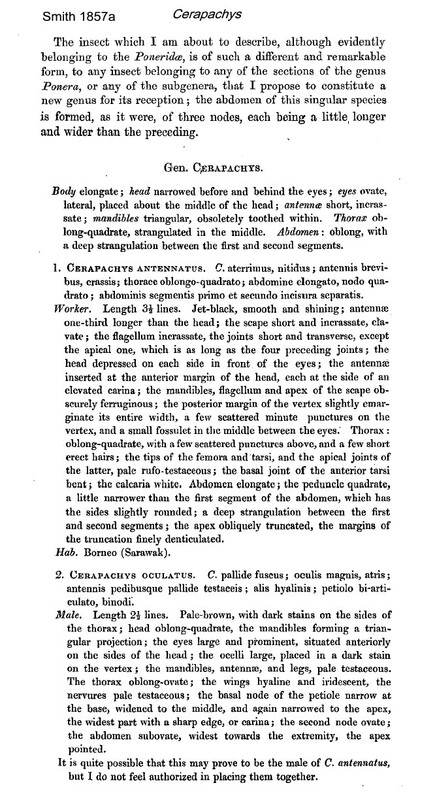 n.
= Phyracaces Emery, 1902, syn. n.
Type-species. Lioponera longitarsus, by monotypy. This is the most species-rich genus that is revived here from synonymy under Cerapachys. Lioponera occurs only in the Old World and all species observed thus far prey on other ants. Lioponera longitarsus Mayr, 1879: India, comb. rev. Lioponera collingwoodi (Sharaf, 2007): Egypt, comb. n.
Lioponera noctambula Santschi, 1910a: Tunisia, comb. rev. I (BT) have no problem with the resurrection of Lioponera but feel strongly that the concept of "non-army ant dorylomorphs" is most unhelpful from the point of view of taxonomy, or classification, based on readily visible anatomical characters rather than invisible DNA evidence. Diagnostic Features - Head with clypeus narrow so that antennal insertions are quite close to the anterior margin of the head, frontal carinae raised exposing the condylar bulbs of the antennae. Antenna thick with short clavate scapes and funiculi. Eyes usually present, may be minute or absent. Alitrunk box-like and rigid, with dorsum devoid of sutures. Petiole of a single segment, although the constriction between the first and second gastral segments may be very deep, such that petiole is effectively two-segmented. Pygidium impressed, armed laterally or posteriorly with spines or denticulae. Sting well developed and functional. Essentially monomorphic, though often with a considerable range of sizes in a single species and even in a single nest series (Brown, 1975). Revisions by Brown (1975: 18), who synonymized Phyracaces with Cerapachys F. Smith (1857a: 75) and had Cerapachyini, as a ponerine tribe, and by Bolton (1990a, 1990b) who considered it as a member of the doryline section. This is where Hölldobler & Wilson (1990) have them but the subfamily was resurrected by Bolton (1994), was used by Belshaw & Bolton (1994b), and remains in Bolton (1995). It seems sensible, therefore, to retain the subfamily. Sphinctomyrmex - gaster with marked constrictions between segments 1 & 2, 2 & 3 and 3 & 4; pygidium exposed dorsally, pointed, rounded or excavated, and armed with numerous minute spinules - not known from Egypt. Simopone - gaster with constriction only between segments 1 & 2; middle legs without tibial spurs; pretarsal claws usually with a single preapical tooth - not known from Egypt. Cerapachys - gaster with constriction only between segments 1 & 2; middle legs with tibial spurs; pretarsal claws always simple. Diagnostic Features - Antennae 11- or 12-segmented, the apical funicular segment greatly swollen, forming a club. Genus longitudinally carinate, eyes present. Petiole a massive node, never marginate laterally. The gastral constriction may be extreme, so that in some species there is a petiole and a post-petiole. Middle and hind tibiae with two spurs, claws simple. Smith's (1857a) genus definition is at . Egyptian species - (see above) nominally these are Cerapachys longitarsus (Mayr) and Cerapachys collingwoodi Sharaf; possibly also, from Tunisia, Cerapachys noctambulus (Santschi). On the species pages comparisons of type images of the available males suggest all three may be synonymous, with C. longitarsus as the earliest. Questions are raised, however, as to whether any of the males are actually longitarsus.